Bermuda is a beautiful island destination just two hours from New York. You can hop on a plane and get away for a weekend of elegant dining and romantic walks on the beach. If you have time for a longer vacation, resorts often offer free nights and other enticing perks for stays of three to five nights. Our list includes stylish beach hotels and resorts where you can play golf, get massages at the spa and enjoy water views from your room. The first new hotel built in Bermuda in almost a decade, The Loren is very different from what people are expecting from this popular Caribbean destination. Snuggled on the edge of a small slip of gorgeous pink sand beach overlooking the immense expanse of the Atlantic, The Loren is dreamy, clean, and white, simple and elegant, with an infinity pool that connects the hotel with the ocean. The hotel has 45 spectacular, oversized, and beautifully decorated rooms that all have ocean views through floor-to-ceiling windows as well as free-standing tubs, and terraces. The lobby is dominated by a quirky spiral staircase and masses of flowers, feeling more like an elegant and intimate living room than a hotel lobby. Rosewood Tucker's Point is a luxury beach getaway in Bermuda with 88 guest rooms and suites featuring refined finishes and artwork. Bathrooms feature deep soaking tubs, perfect for relaxing on vacation. Balconies and terraces let guests experience indoor/outdoor living at its finest. Luxury guest suites have wet bars with ice makers, and most have fireplaces. The Spa has eight tranquil treatment rooms and a signature SilverTag Shower hydrotherapy suite. After a luxury treatment, guests can relax next to the reflecting pool with a fireplace. There is also a beautiful Yoga and Tai Chi lawn. Vacation activities include kayaking motorboats, sailboats, windsurfers, and scuba instruction. The hotel has a 1,900 square-foot Fitness Center with all the latest equipment. The Point Restaurant has twin outdoor fireplaces, Gerard Henderson murals and an English long bar. The Golf Beach and Tennis Club features a Roger Rulewich-designed, 18-hole championship course which offers many scenic oceanview holes. The resort was awarded Green Globe certification for its environmental tourism practices. It is the first property in Bemuda as well as the first Rosewood resort to receive the eco certification. 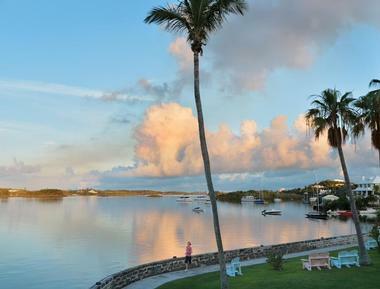 The resort has a wastewater treatment plant, solar hot water plant, Sea Water Reverse Osmosis Plant, Thermal Solar Hot Water System (Bermuda’s largest installation to date), and solar cars on property. The resort's Green Team meets on a regular basis, educating the staff on how to properly clean a room, what green products to use and what items to recycle (+1 441 298 4000). 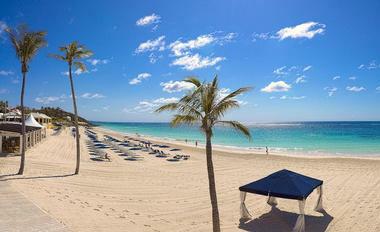 Fairmont Hamilton Princess is a luxury resort located in the harbor town of Hamilton, Bermuda. The architecture of the hotel reflects influences from British colonial times. In addition to swimming and relaxing in the sun, vacationers can visit nearby galleries, shops and museums. If you are looking for a quick island getaway from the East Coast, Bermuda is about two hours by plane from New York. The hotel offers 410 guest rooms and suites furnished in an elegant Victorian style. If you want a view of the harbor, ask for a Deluxe Room or a Signature Room both of which have a balcony with patio table and chairs, ideal for a romantic vacation. The Fairmont Gold floor features private check-in, cocktail hour, snacks, concierge services, and complimentary breakfast. The resort has two outdoor swimming pools, perfect for relaxing in the sun with a cool drink. Harley's Restaurant, located harborside, offers al fresco dining. The Heritage Court is the place to be seen and is acclaimed for its Afternoon Tea. If you are planning a quick romantic island getaway, the resort can prepare a Candlelight Dinner for two on the private room patio. Low season rate starts from $289 USD per night and high season rate starts from $379 USD (441-295-3000, 800-441-1414). 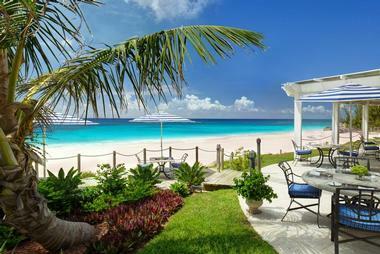 Cambridge Beaches is a luxury hideaway located in Somerset, Bermuda. The town of Hamilton is 25 minutes away by ferry. This resort is ideal for romantic getaways, honeymoons and weddings. The hotel offers beautiful surroundings, attentive service, and award-winning cuisine. Situated on a twenty-five acre peninsula, this unique hideaway features spectacular sunsets and five private beaches, ideal for a luxury vacation in the sun. Guests can choose from numerous vacation activities at the resort such as tennis, croquet, sunbathing, swimming and snorkeling. The hotel's spa offers a roman-style pool and solarium with sunroof, whirlpool, current pool and fitness center. The lower level at the spa houses intimate treatment rooms, Swedish sauna, Turkish steam bath and hydrotherapy baths. Couples on their honeymoon can book a luxurious side-by-side treatment at the spa. The hotel concierge can arrange reef snorkeling, sunset sailing, championship golf, scuba-diving adventures, kayaking and fishing. The resort has a private marina with a diverse selection of water sports equipment. It is clear from its diverse offerings that the resort understands the importance of good food on vacation. You can plan a romantic dinner at the formal indoor Tamarisk Room or at the more informal waterside Bay Terrace. 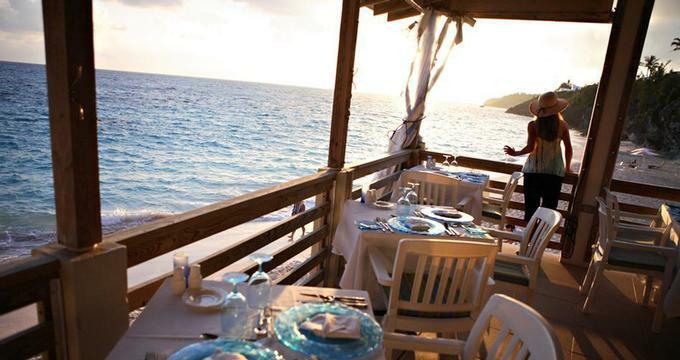 Breezes restaurant offers casual open-air dining with panoramic views and romantic sunsets. For a unique dining experience, try the Chef's Table. This one-of-a-kind restaurant creates the menu each day, taking into account special preferences of its guests. If you want to surprise your loved one with an intimate dinner for two, the resort can set your dinner table on the beach at Turtle Cove. The best time to visit Bermuda is late spring trough fall when the weather is warm. The island is about two hours by plane from New York City. Room rates start at USD $525 per night (800-468-7300, 441-234-0331). Elbow Beach is a luxury getaway near downtown Hamilton, offering a beautiful sandy beach, spa and tennis. Check into the Fairmont Southampton if you want access many different activities and restaurants. 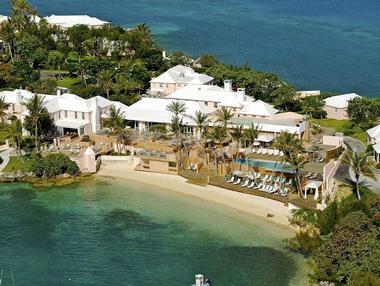 Located in Southampton, the Reefs Resort & Club is one of Bermuda's best hotels with its own private pink sand beach, attentive service and a full-service spa. The Reefs features a freshwater infinity pool with spectacular views of the ocean. Guests who like to stay active on their getaway can use two all-weather tennis courts and the fitness facility on a complimentary basis. Complimentary snorkeling equipment, kayaks and floats are also available. La Serena Spa offers authentic traditional Thai massage, facials and body treatments, reflexology, Asian botanical treatments, herbal pedicures and manicures. The hotel can arrange an array of island activities, including scuba diving, sport fishing, sailing, parasailing, jet skiing, glass bottom boat cruises, horseback riding and golf at several nearby courses. Choose from 62 guest rooms and suites, and 19 club condominiums. Ask for a room with a balcony overlooking the ocean. You can also try one of the Point Suites have bathrooms with large Jacuzzis as well as private ocean-view balconies with outdoor Jacuzzis. The cottages are especially convenient for family vacations; they are spacious and offer private patios with outdoor Jacuzzis. The hotel has three restaurants: Ocean Echo, Royston's and Coconuts (open seasonally). If you are planning a romantic dinner for two, ask the hotel to serve your dinner on the beach. VacationIdea.com Vacation Tip: Call before you go and request your in-room refrigerator to be stocked with your preferred items. Rates start at USD $352 per night. The rate includes breakfast daily (800-742-2008, 441-238-0222). Bermuda has all of the standard activities and resort amenities of a tropical island vacation destination. A great advantage of heading to Bermuda for your vacation is that it only takes around two hours to get there from the East Coast of the United States. Airlines that fly to the island include Continental Airlines, American Airlines, Delta Airlines, US Airways, Air Canada, United Airlines, and British Airways all fly to Bermuda. How long is the flight from New York to Bermuda? About 2 hours and 10 minutes. The flight from London to Bermuda takes about 7 hours. Since rental cars are not allowed, you can travel by bus, taxi, ferry, bicycle, or by horse and carriage. The most popular form of transportation is the motor scooter. If you decide to rent a scooter don't forget that you'll have to drive of the LEFT side of the road. Bermuda is a beautiful island destination, offering sunny beaches, great restaurants and many activities. Whether you are looking to save on rooms, a family package or a golf special, you've come to the right place. Elbow Beach, a Mandarin Oriental hotel, is offering a Family package from $611 which includes: Daily breakfast for four at Lido or in the privacy of your room, Four Aquarium Day Passes, 50-Minute Oriental Essence Massage for one person, Three hours of babysitting, Complimentary access to The Camp, 50% off a second guestroom. Minimum three-night stay. Receive the 3rd night free at The Fairmont Southampton. Ask for the "Free Nights in Bermuda Offer." The longer you stay, the more you save. Another great offer at the hotel is the "Dive Package" with rates from $70 USD per night which includes: Luxury room accommodation and a guided two tank dive. 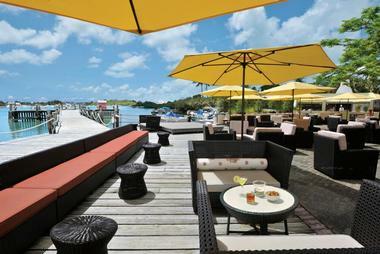 Get a free 3rd or 4th night free at The Reefs Bermuda, depending on the dates of travel. Play unlimited golf at Tucker's Point with the Unlimited Golf Add-On special. Add Unlimited Golf to your existing reservation (minimum 3 nights) for $99 per person, per night. The offer includes green fees, a GPS guided cart and exclusive seamless access to golf tee times at the renowned Mid Ocean Club on Mondays, Wednesdays & Fridays (additional fees apply at Mid Ocean Club). Unlimited Golf can be added to a stay at any point, but once added will be charged for the remainder of the stay. If you are planning to honeymoon, check into the luxury Tucker's Point and ask for the Seven Night Honeymoon package. The package includes full breakfast and dinner daily served in one of Rosewood Tucker's Point several restaurants, a welcome amenity of champagne and strawberries, a romantic in-room drawn bath, two rounds of golf at Rosewood Tucker's Point Golf Course, one round of golf at Mid Ocean Golf Course (Mondays, Wednesdays, and Fridays), one 80-minute couple's massage, one half-day private tour of Bermuda and $300 in water sports activity credits to be used during the stay.